Campobasso (Italy), April 15 (IANS/AKI) Italian Premier Giuseppe Conte on Monday urged a negotiated solution to the escalating conflict in oil-rich Libya between the internationally recognised government in Tripoli and forces loyal to eastern military strongman Khalifa Haftar. He also called on Haftar's militia to withdraw from Tripoli and urges an immediate truce in the fighting with forces loyal to the internationally recognised government. "Armed conflict is not the solution. We have a precise strategy and want a political solution," Conte told reporters upon his arrival in the southern Italian city of Campobasso for talks with local officials. 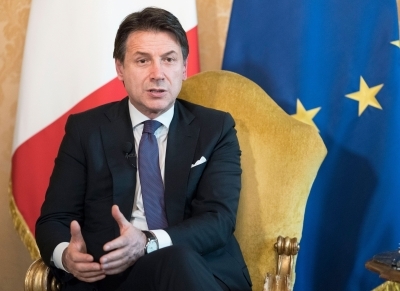 "I will do my utmost to ensure that all Libyan stakeholders as well as members of the international community work together for a peaceful solution in Libya and its permanent stability," Conte added. Italy's first priority is a truce in the fighting and talks are taking place in Rome between the government, Qatar's Deputy Premier and Foreign Minister Mohammad Al Thani and Libya's UN-backed Prime Minister Fayez al-Sarraj's deputy Ahmed Maitig, Conte said. "We are following the unfolding events in Libya and are worried because we must stem this armed conflict without fail," he said. The warfare in Italy's former colony has intensified this month since Haftar began a military offensive against "terrorist" groups in the capital in which at least 160 civilians have been killed and 16,000 have fled their homes, according to the UN. The tripartite talks in Rome on Monday are a sign of Italy's eagerness to play a greater role in Libya, according to observers. Earlier Conte, after talks with Qatar's Thani in Rome, told reporters that Italy hopes that the Libyan National Army troops will withdraw from Tripoli, referring to Haftar's self-styled force. "We want an immediate ceasefire," he said. Qatar shared Italy's "intense concern" at the "military escalation" in Libya and that "this cannot be the answer" to the lawless country's problems, Conte said. Thani earlier held talks in Rome with his Italian counterpart Enzo Moavero Milanesi which allowed "an in-depth exchange of views on the most recent dynamics of the Libyan crisis," according to a statement. Libya has been wracked by conflict since the Nato-backed ouster of late dictator Muammar Gaddafi in 2011. Rival administrations in the east and west are backed by a myriad of militias vying for power in the oil-rich country, which was an Italian colony from 1911-1947. Meanwhile, Italy's embassy in Libya on Monday brushed off social media reports that it had closed amid the escalating military conflict in Tripoli, tweeting that it was "open" and was operating normally. "There has been no reduction of Italy's institutional presence in Libya," the tweet added.